See more objects with the tag borders, women's fashion accessories, personal adornment, grapes, grid, zigzags, neckwear, cross-disciplinary. See more objects with the color sienna darkolivegreen darkkhaki darkolivegreen grey or see all the colors for this object. This is a Square or scarf. It was created by André Derain. It is dated 1947 and we acquired it in 1950. Its medium is silk and its technique is screen printed. It is a part of the Textiles department. 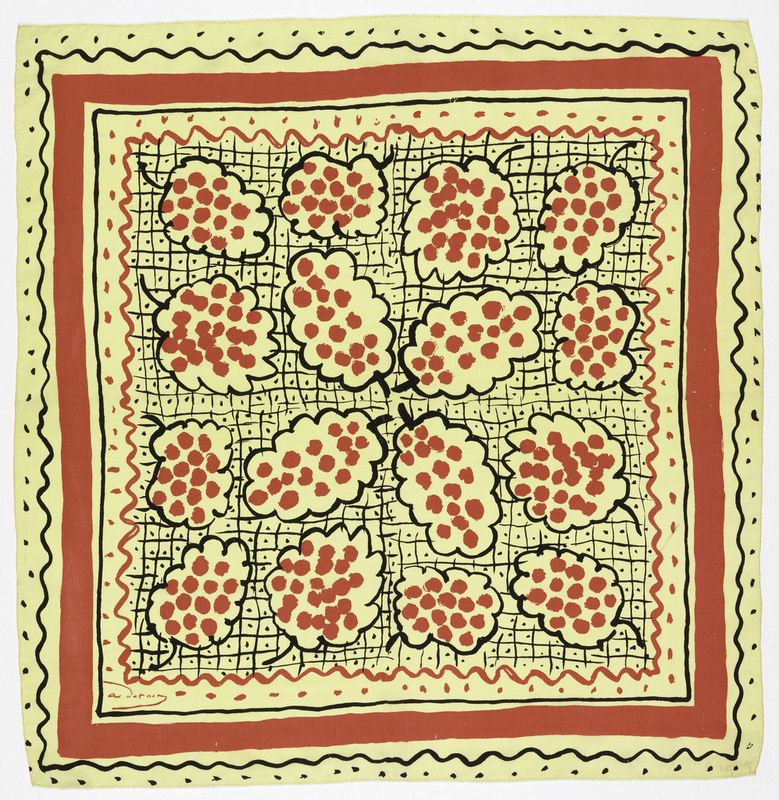 This headscarf is one of a series known as the Ascher Squares, produced as part of an historic collaboration between Ascher Studios, an haute couture textile company in London, and more than fifty modern artists, including Henry Moore, Jean Cocteau, Alexander Calder, and painter André Derain, who designed the headscarf featured here. Ascher Studios gave the artists carte blanche, so long as their designs measured 36 inches square. Some artists, like Derain, created abstract patterns that covered the entire surface, while others treated the surface more like a canvas, creating a central image that would be obscured if the scarf were folded or draped. The Studio received the designs in chalk, gauche, watercolor, and pen and ink, among other media, and it sometimes took months of experimentation before a design was successfully transferred to a screen frame for printing. Only two to six hundred scarves of each design were printed, and the frames were destroyed after production, making the scarves highly collectible works of art. It is credited Gift of Cooper Union Art School.